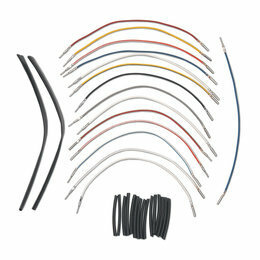 No cutting, soldering or hassle Kits include color-coded wire, OEM pin connectors, 1/8" and 3/8" shrink tubing, complete instructions, illustrations, and wire block diagram Can be internally wired through handlebars Connector Type: OEM Length: +24" Made in the USA: Yes Wire Count: 17 Please note: Kit contains extensions for both sides of handlebars; additional kits must be ordered for H-D radio, H-D CB and electronic throttle and purchased separately in addition to the standard kits. No cutting, soldering or hassle Kits include color-coded wire, OEM pin connectors, 1/8" and 3/8" shrink tubing, complete instructions, illustrations, and wire block diagram Can be internally wired through handlebars Connector Type: OEM Length: +12" Made in the USA: Yes Wire Count: 17 Please note: Kit contains extensions for both sides of handlebars; additional kits must be ordered for H-D radio, H-D CB and electronic throttle and purchased separately in addition to the standard kits. No cutting, soldering or hassle Kits include color-coded wire, OEM pin connectors, 1/8" and 3/8" shrink tubing, complete instructions, illustrations, and wire block diagram Can be internally wired through handlebars Connector Type: OEM Length: +4" Made in the USA: Yes Wire Count: 17 Please note: Kit contains extensions for both sides of handlebars; additional kits must be ordered for H-D radio, H-D CB and electronic throttle and purchased separately in addition to the standard kits. No cutting, soldering or hassle Kits include color-coded wire, OEM pin connectors, 1/8" and 3/8" shrink tubing, complete instructions, illustrations, and wire block diagram Can be internally wired through handlebars Connector Type: OEM Length: +24" Made in the USA: Yes Wire Count: 14 Please note: Kit contains extensions for both sides of handlebars; additional kits must be ordered for H-D radio, H-D CB and electronic throttle and purchased separately in addition to the standard kits. No cutting, soldering or hassle Kits include color-coded wire, OEM pin connectors, 1/8" and 3/8" shrink tubing, complete instructions, illustrations, and wire block diagram Can be internally wired through handlebars Connector Type: OEM Length: +18" Made in the USA: Yes Wire Count: 14 Please note: Kit contains extensions for both sides of handlebars; additional kits must be ordered for H-D radio, H-D CB and electronic throttle and purchased separately in addition to the standard kits. No cutting, soldering or hassle Kits include color-coded wire, OEM pin connectors, 1/8" and 3/8" shrink tubing, complete instructions, illustrations, and wire block diagram Can be internally wired through handlebars Connector Type: OEM Length: +15" Made in the USA: Yes Wire Count: 14 Please note: Kit contains extensions for both sides of handlebars; additional kits must be ordered for H-D radio, H-D CB and electronic throttle and purchased separately in addition to the standard kits. No cutting, soldering or hassle Kits include color-coded wire, OEM pin connectors, 1/8" and 3/8" shrink tubing, complete instructions, illustrations, and wire block diagram Can be internally wired through handlebars Connector Type: OEM Length: +8" Made in the USA: Yes Wire Count: 14 Please note: Kit contains extensions for both sides of handlebars; additional kits must be ordered for H-D radio, H-D CB and electronic throttle and purchased separately in addition to the standard kits. No cutting, soldering or hassle Kits include color-coded wire, OEM pin connectors, 1/8" and 3/8" shrink tubing, complete instructions, illustrations, and wire block diagram Can be internally wired through handlebars Connector Type: OEM Length: +4" Made in the USA: Yes Wire Count: 14 Please note: Kit contains extensions for both sides of handlebars; additional kits must be ordered for H-D radio, H-D CB and electronic throttle and purchased separately in addition to the standard kits. No cutting, soldering or hassle Kits include color-coded wire, OEM pin connectors, 1/8" and 3/8" shrink tubing, complete instructions, illustrations, and wire block diagram Can be internally wired through handlebars Connector Type: OEM Length: +15" Made in the USA: Yes Volts: 12 Wire Count: 15 Please note: Kit contains extensions for both sides of handlebars; additional kits must be ordered for H-D radio, H-D CB and electronic throttle and purchased separately in addition to the standard kits. No cutting, soldering or hassle Kits include color-coded wire, OEM pin connectors, 1/8" and 3/8" shrink tubing, complete instructions, illustrations, and wire block diagram Can be internally wired through handlebars Connector Type: OEM Length: +12" Made in the USA: Yes Volts: 12 Wire Count: 15 Please note: Kit contains extensions for both sides of handlebars; additional kits must be ordered for H-D radio, H-D CB and electronic throttle and purchased separately in addition to the standard kits. No cutting, soldering or hassle Kits include color-coded wire, OEM pin connectors, 1/8" and 3/8" shrink tubing, complete instructions, illustrations, and wire block diagram Can be internally wired through handlebars Connector Type: OEM Length: +8" Made in the USA: Yes Volts: 12 Wire Count: 15 Please note: Kit contains extensions for both sides of handlebars; additional kits must be ordered for H-D radio, H-D CB and electronic throttle and purchased separately in addition to the standard kits. No cutting, soldering or hassle Kits include color-coded wire, OEM pin connectors, 1/8" and 3/8" shrink tubing, complete instructions, illustrations, and wire block diagram Can be internally wired through handlebars Connector Type: OEM Length: +18" Made in the USA: Yes Volts: 12 Wire Count: 12 Please note: Kit contains extensions for both sides of handlebars; additional kits must be ordered for H-D radio, H-D CB and electronic throttle and purchased separately in addition to the standard kits. No cutting, soldering or hassle Kits include color-coded wire, OEM pin connectors, 1/8" and 3/8" shrink tubing, complete instructions, illustrations, and wire block diagram Can be internally wired through handlebars Connector Type: OEM Length: +15" Made in the USA: Yes Volts: 12 Wire Count: 12 Please note: Kit contains extensions for both sides of handlebars; additional kits must be ordered for H-D radio, H-D CB and electronic throttle and purchased separately in addition to the standard kits. No cutting, soldering or hassle Kits include color-coded wire, OEM pin connectors, 1/8" and 3/8" shrink tubing, complete instructions, illustrations, and wire block diagram Can be internally wired through handlebars Connector Type: OEM Length: +12" Made in the USA: Yes Volts: 12 Wire Count: 12 Please note: Kit contains extensions for both sides of handlebars; additional kits must be ordered for H-D radio, H-D CB and electronic throttle and purchased separately in addition to the standard kits. No cutting, soldering or hassle Kits include color-coded wire, OEM pin connectors, 1/8" and 3/8" shrink tubing, complete instructions, illustrations, and wire block diagram Can be internally wired through handlebars Connector Type: OEM Length: +8" Made in the USA: Yes Volts: 12 Wire Count: 12 Please note: Kit contains extensions for both sides of handlebars; additional kits must be ordered for H-D radio, H-D CB and electronic throttle and purchased separately in addition to the standard kits.